26 Dec 2017 - Osceola Velo Club's Pat Schlager finished 8th in Single-Speed at the very chilly (12 deg F) Boxing Day Cyclo-Cross race held at Leawood City Park, KS. Check out a photo of Pat S. all bundled up at the start. 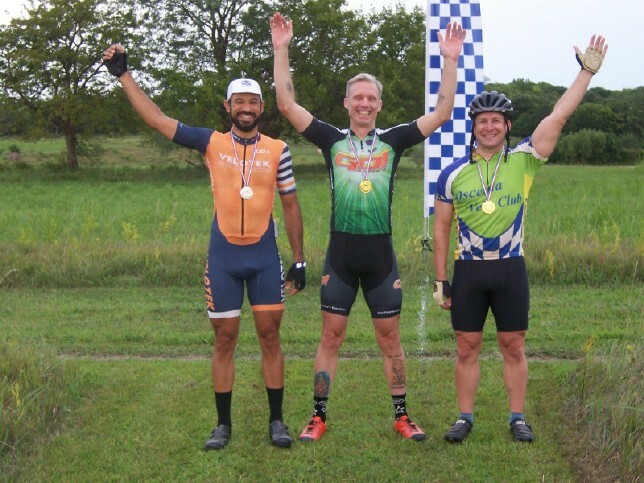 26 Nov 2017 - Osceola Velo Club's Pat Schlager finished 9th in Single-Speed at The Fast & the Furriest Cyclo-Cross race held at the Humaine Society of Greater Kansas City. Pat S. broke his crash/injury curse at this event by staying upright and unharmed this year. 19 Nov 2017 - Osceola Velo Club's Pat Schlager finished 11th in Single-Speed at the 360 Cup held at Centennial Park in Lawrence, KS. The 360 Cup also served as the Kansas State Cyclo-Cross Championships for Categories including Single-Speed. Check out some photos of Pat S. at "State." 05 Nov 2017 - A cloudy, windy, chilly day greeted racers for the 2nd round of the 2017 Series60CX points series, the Boulevard Cup, held at Stump Park in Shawnee, KS. Osceola Velo Club's Pat Schlager finished 8th in Single-Speed which bumped him up to 6th overall in the 6-race points series. Check out some photos of Pat S. at Stump Park. 15 Oct 2017 - Osceola Velo Club's Pat Schlager raced both days at the Joules 'Cross held at the Schwada Cyclo-Cross Field just NW of Lawrence, KS. Pat S. finished in 10th place in Single-Speed Saturday despite another rear wheel puncture forcing Pat to "hoof it home" once again. Pat broke his "Flat-Tire Curse" Sunday, finishing 9th in Single-Speed actually riding his bike across the line. Check out some photos of Pat at Joules. 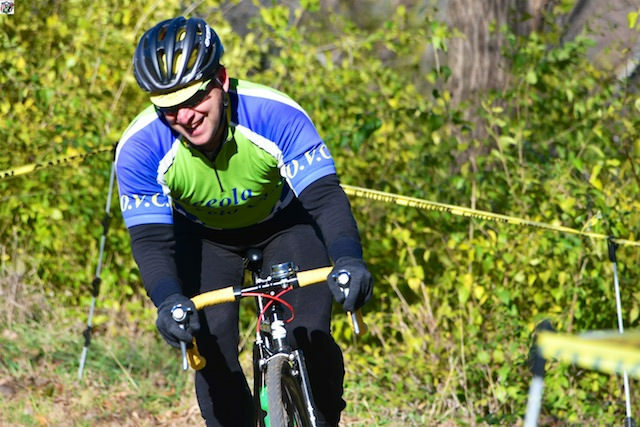 01 Oct 2017 - Osceola Velo Club's Pat Schlager was on hand for the first race in the 6-race Series60CX points series, the Castle 'Cross, held just south of the Historic Jazz District in Kansas City, MO. As usual, a very challenging and fun course which included many "natural" obstacles -- pavement, gravel, dirt, grass, bumps, a broken up brick alleyway, broken concrete stairs, and of course, "The Castle." Pat S. was having a fun race until a rear wheel puncture with two laps to go put a damper on it. Still, Pat walked/jogged his bike to finish his race, Single-Speed, in 15th place, Here are some photos of Pat riding his bike prior to his puncture. 30 Sep 2017 - The 2017 Kansas Road Racing Season wrapped up today with the 10 KM Octoginta Time Trial held on "Old K-10" between Lawrence and Eudora, KS. 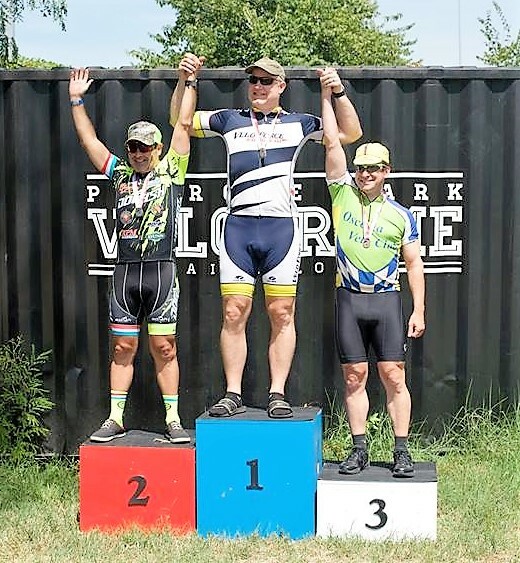 Osceola Velo Club's Pat Schlager dusted off his 25+ year-old road racing bike (complete with down-tube shifters) and posted a time good enough for 3rd in the Men's Merckx category. Check out some photos of Pat S. rocking it "old school." 21 Sep 2017 - Osceola Velo Club's Pat Schlager was on hand for the final race in the monthly John Brown Time Trial Series held just outside DeSoto, KS. The flat, out-and-back, 8 KM course was tailor made for Pat S.'s track bike (fitted with a mechanical front brake, of course). Pat finished first in the Retro Merckx Single-Speed category. 26 Aug 2017 - Osceola Velo Club's Pat Schlager made his annual drive on over to the Penrose Park Velodrome in St. Louis, MO for the 2017 Missouri State Track Championships. 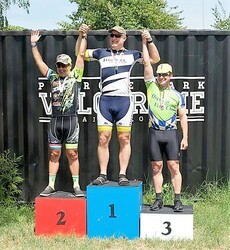 Pat S. posted a personal 2nd best time (for Penrose Park Velodrome) in the qualifying Flying 200 Meter Individual Time Trial then finshed 3rd in the Masters 35+ Match Sprint bracket. Check out a photo of Pat on the podium in STL. 06 Aug 2017 - The 2017 Kansas Track Cycling Season wrapped up with the Kansas State Track Championships held at the Lawrence Grass Velodrome located just outside Lawrence, KS. Osceola Velo Club's Pat Schlager competed in four events -- the 500 Meter Individual Time Trial, the 1000 Meter Individual Time Trial (the "Kilo"), and two Scratch Races (Age Group and Category). Pat S. won Gold in the 500 Meter Time Trial and Silver in the Age Scratch Race. Check out some photos of Pat racing in the "Kilo." 03 Aug 2017 - Osceola Velo Club's Pat Schlager finished 3rd overall in the Coach Pat's Thursday Night Omnium Training Race Series held at the Lawrence Grass Velodrome located just outside Lawrence, KS. The 6-race Omnium consisted of the Flying Lap, Handicap Race, "500 Meter" Time Trial, Points Race, Inidvidual Pursuit, and Elimination Race. Pat S.'s 3rd in the Flying Lap, 3rd in the Handicap Race, and 2nd in the "500 M" Time Trial earned him enough Omnium Points to hold onto the Bronze Medal in the overall. Check out a photo of Pat on the podium. 04 May 2017 - Osceola Velo Club's Pat Schlager drove out to the Olympic Training Center (OTC) Velodrome in Colorado Springs, CO to take part in their bi-weekly Sprint Series. Pat S. was there to reconnoiter the track and the elevation, and test out gear combinations as well as his early season form. Check out some photos of Pat at "The 'Drome Under the Dome."